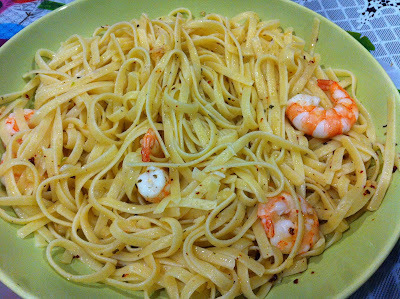 don't let the name fool or scare you off - aglio olio is pretty much easy to prepare. 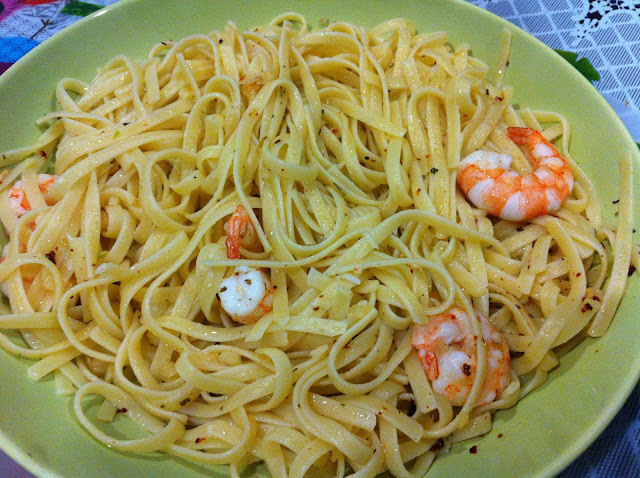 aglio olio is the healthier pasta option. it's extra light, delish and filling. we usually have it at restos mixed with steak or seafood, and well, dunno 'bout you but "aglio olio" is just so sophisticated-sounding and a bit of intimidating that i honestly thought it was hard to prepare! (or the ingredients would be hard to find, and in both counts i was wrong). Cook pasta and drain, set aside afterwards. Heat olive oil over a medium-heat pan. Saute minced garlic until medium-browned. Add in the peeled shrimps until cooked. Lastly, mix in the cooked pasta. Garnish with as much chili flakes and herbs as you wish. Serve hot. Based on experience, recipe served two. We dined with white wine to perfect the "ala fine dining experience."